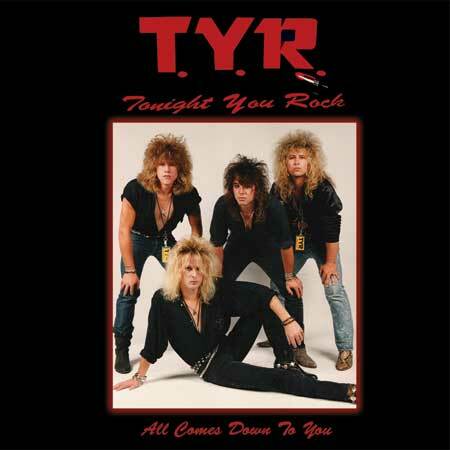 Our friend Valentine wants you all to have a free Tonight You Rock (TYR) download! Simply sign the TYR guest book at www.tyr-online.com or send a friend request to the band's Myspace page at www.myspace.com/tyronline or leave a comment on the Myspace. After that, send an email to to Valentine so he has your address to deliver your song. Put "Bring Back Glam Song Offer" in the subject line. Click the word "Valentine" to email him. That's it! I'm not sure what song you'll receive - perhaps everyone will get the same track, or Valentine might decide to mix it up a bit. This is important: do not email me with requests! Only Valentine can legally fulfill this offer. The power quartet of T.Y.R. formed in the mid-1980s in the San Francisco Bay area. Fronted by Joel Valentine and driven to excess by guitarist Gregg Michaels, bassist Dave Hayes and stick man Kevin St. James, the band opened for some of the biggest names in the Glam Metal genre including the BulletBoys, Extreme, Tora Tora, Dangerous Toys, Roxx Gang, Junkyard and Y&T. T.Y.R. isn't all about nostalgia. In October 2006, the band reunited for a 20th anniversary show. That show proved the energy and chemistry still existed between the band members. The remastered collection proves the drive is still present and accounted for - if the listener is ready to rock! The remastered release - titled All Comes Down To You - is now available on the Retrospect Records imprint. All Comes Down To You - Price $10.00 US plus $5.00 S&H to the US and Canada - outside the US and Canada S&H depends on the the country shipped to.